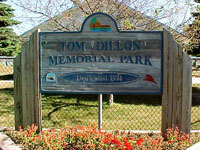 Tom Dillon Memorial Park is located at 720 Smith Street in East Tawas. The park features a covered picnic pavilin with restrooms and kitchen, a youth softball field, horseshoe pits and a "Fire Department" themed play structure. 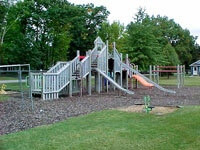 This park is also a host site of the Tawas Knothole Association who have hosted several district and regional little league and senior league softball tournaments at the park. Tom Dillon Park is also the 10 & Under site for the Tawas "Summer Sizzler" tournament held in June. With it's quaint neighborhood location, Tom Dillon Park is a popular site for neighborhood gatherings, graduation parties, etc. throughout the summer and is available for private rental.